A massive nation in both geographical size and population, India's relative proximity to the equator allows it's rainy summers to be both hot and humid--reason enough to find respite under a soothing shade tree. While many non-native trees now are grown as ornamental plants in modern-day India, several native trees remain common shade trees for streets or parks. Although dependant on species, these trees are not overly tolerant of cold, and should be grown only in U.S. Department of Agriculture hardiness zones 9 and warmer. 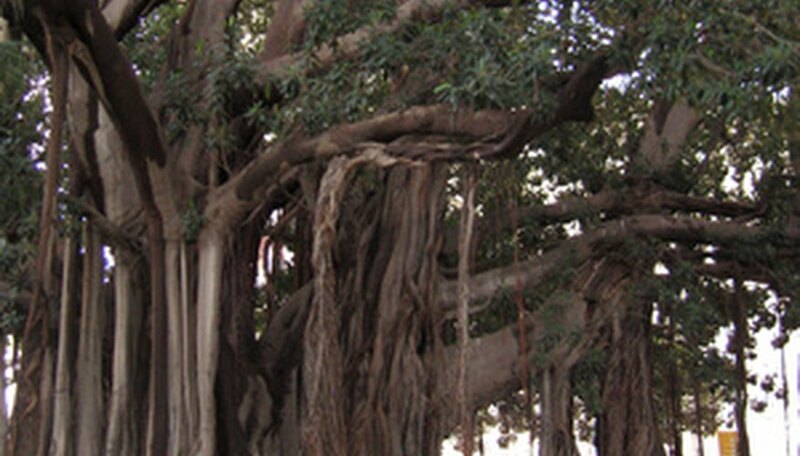 Sacred to Hindus, the aerial roots that support the massive horizontal branches of the banyan (Ficus benghalensis) can create a matrix of shade for many people to dwell under. It grows anywhere from 30 to 100 feet tall, depending on age, and it is always wider growing than it is tall. It needs a lot of space to grow, so it is best only in expansive parklands. Another species of banyan is the rubber plant (Ficus elastica), which is extinct in the wild. It was once native from the Himalayas to Indonesia, according to Margaret Barwick in "Tropical and Subtropical Trees." This large-leaved evergreen tree grow upwards of 200 feet tall and nearly as wide and was the original source of latex to make rubber. The barringtonia (Barringtonia asiatica) is revered for its massive trunk, evergreen foliage and fragrant white flowers that are pollinated by bats. Tolerant of seaside conditions, this large shade tree grows 70 feet tall and 75 feet wide. It is best in the humid reaches of southern and central India. Another species called Indian oak (Barringtonia acutangula) grows only as a shrub. Also called Alexandrain laurel, this native tree (Calophyllum inophyllum) with glossy, dark green leaves makes a good shade tree in windy and coastal landscapes. Sweetly scented white flowers appear in both spring and late summer, yielding fruits called punnai nuts. The slow-growing Indian laurel grows 115 feet tall and 60 feet wide. With an upright canopy of branches and light green, airy leaves, Indian rosewood (Dalbergia sissoo) works very well as a shade tree along avenues. It vigorously suckers from its roots, creating a thicket of trees and will quickly grow to nearly 70 feet tall and equally wide. It is drought-tolerant and provides only broken shade, allowing some direct sun to reach the ground below. Deciduous in winter, Indian parasol tree (Firmiana colorata) begins providing shade in early spring when the many bright fuchsia-magenta flowers appear. It has an upright but rather narrow canopy at 80 feet tall and 30 feet wide. The timber wood from the Indian padauk (Pterocarpus indicus) smells of roses, leading it to be synonymously called Burmese rosewood as well as angsana and naga. Fast growing, this volumnuous tree grows creates a canopy 100 feet tall that is equally wide. It bears golden yellow pea-like flowers in spring for a very brief but fragrant display. Indian padauk trees grow best in fertile soil that has seasonal floods.